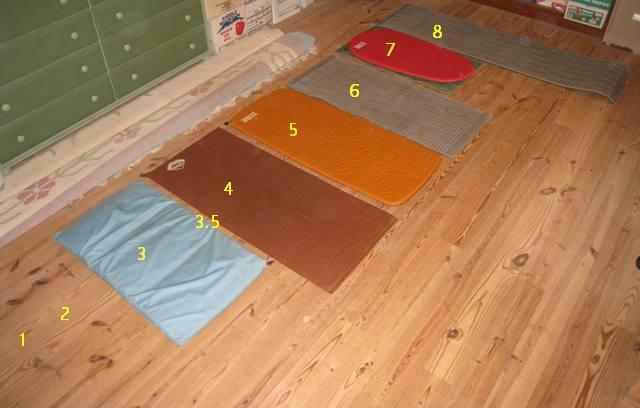 Maybe the perfect sleeping pad set up (at least for me)! Lightweight, comfortable, warm and durable. Read on. Pads were not much of an issue in the early days when we mostly camped in warm weather and were tougher, “pad what pad?” Now though, almost all of my trips are in cool to cold weather with night temperatures mostly between freezing and 20 degrees, my bones are getting older and I have become a side sleeper. Getting a comfortable and warm nights sleep is more difficult. When Thermarest first came out with their inflatable foam pads it seemed like a great answer for comfort and moderate insulation. Having been through a series of their lightest pads, they have performed pretty well with the exception of the occasional leak/hole that leaves one on the cold, hard ground; uncomfortable for sure, dangerous if really cold. Forget carrying the patch kit, it is impossible to find the tiny holes in the field, you have to have a hose or tub of water and then it is difficult (tip- use soapy water, it makes bigger bubbles where the leak is). 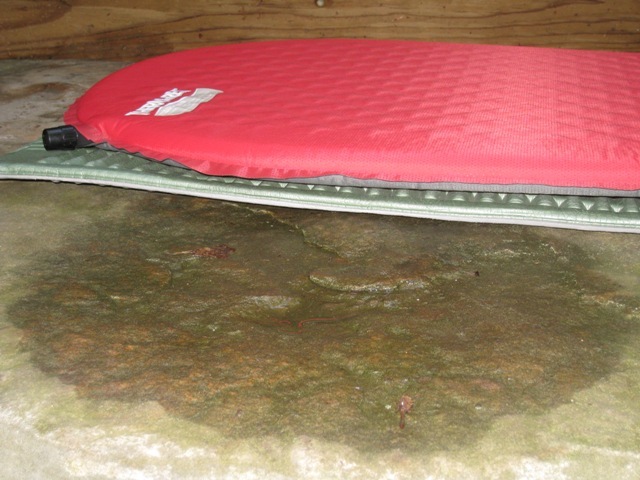 For a time I even went back to just a Ridgerest closed cell pad to save weight and avoid the deflation issue, it was light but I slept like hell. Finally on several sub 20 degree trips I took a full length Ridgerest to put under my Thermarest 3/4 inflatable for extra insulation. On some of the hard wooden shelter floors on the AT not only was I warm but extremely comfortable. I began thinking about a combination pad system that would be comfortable, warm, tough (puncture resistant) and light. A note on warmth, there has been much discussion on Backpacking Light about the R-value needed to stop heat loss to cold and frozen ground and the thought is an R-value of 5.0 . So that is the number I have been working with to find a combination of pads to put together to have a combined R-value of 5.0-6.0 for the coldest trips and close to 5.0 for the cool season trips. Two other factors come into play. First, the packs I have now use the sleeping pad as part of the suspension system, and a closed cell pad like a Ridgerest is the best. 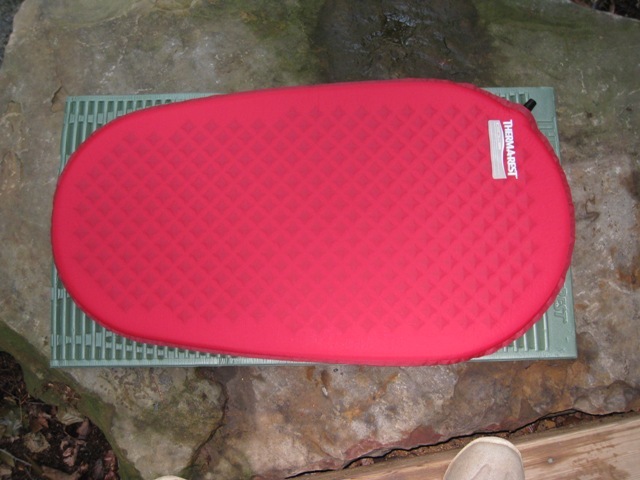 Second, I have used a Thermarest chair kit for years and need a pad(s) that will work with the chair. That means a pad(s) that is 20 inches wide and at least 36 inches long. As an aside on the chair thing, don’t start with me about how carrying a chair is unneeded extra weight, maybe for you but not for me. I come from the Colin Fletcher school of reclining with the support of a propped up frame pack and as he said “an internal frame pack makes a scurvy backrest”. In an attempt to save weight I even went for a while without the chair and was consistently uncomfortable in camp, so started carrying it again. Most of my nights are long and cold so I want to sit up, with my legs in the sleeping bag, cooking, reading, taking in the night. I am getting too old to sit cross legged without back support and the trees and rocks are rarely in the right place for me to use. 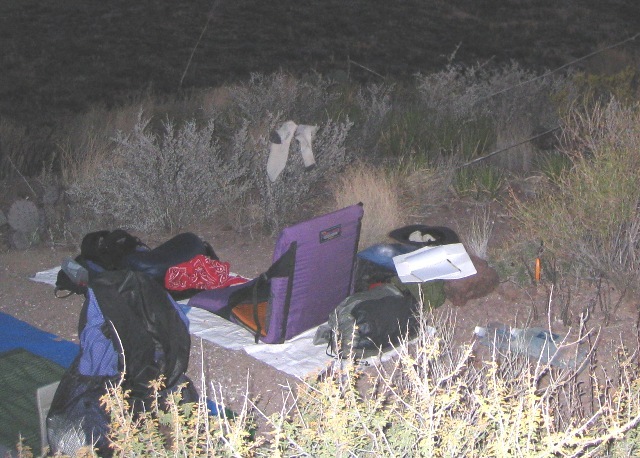 I finally put it together in 2008 on one of the across Big Bend walks by using a cut down 36″ Ridgerest under my old 47″ Thermarest Prolite 3. 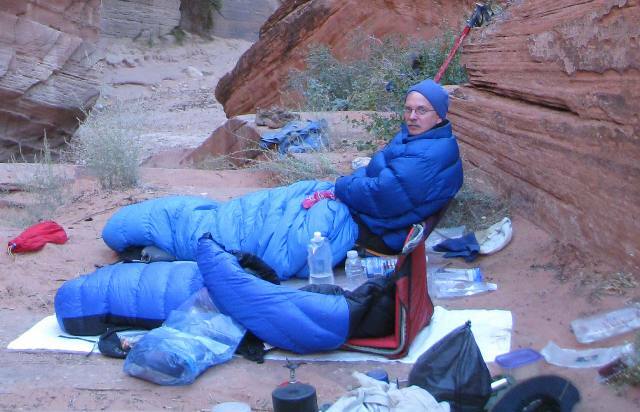 We slept on mostly rock surfaces with temperatures down into the 20’s. It was very durable with the closed cell pad on the ground to protect from thorns and rocks and the inflatable pad on top which I could deflate a little and get the hip and shoulder hole effect. It worked perfectly both in my chair kit and as the frame in my Six Moons Designs Starlite pack. The combination (without the chair) weighed only 18 ounces with an R-value of 4.8 and 1.66 inches of padding. 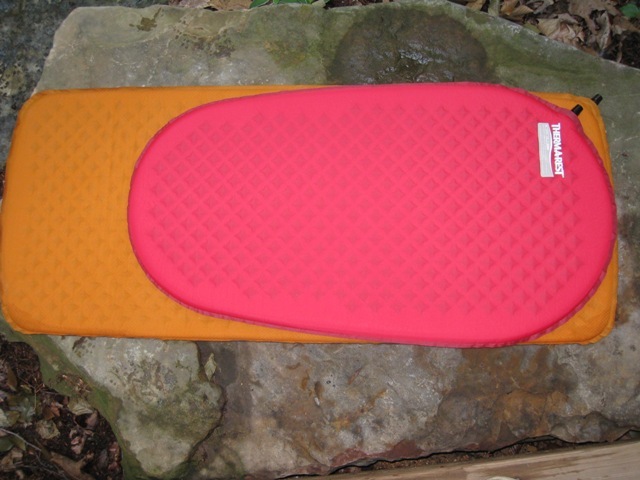 Thermarest finally came out with a 36″ Prolite XS that weighs 8.3 ounces (my scales) which puts the pad combo at just over 14 ounces. All three components together are brilliant- comfortable, warm, tough. Since 2008 I have had no pin hole leaks or deflation issues despite many desert trips. I know of no other pad or pad combination that is this light and gives the warmth, toughness and comfort. 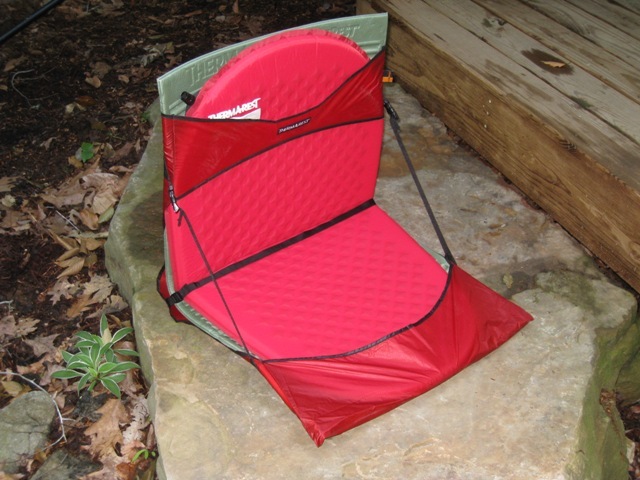 The latest on chair kits: for several years I have used the lighter Thermarest Compack chair (shown below in red) made out of a lighter cordura Silnylon but after returning two of them due to fabric failures around the “hinge” area that holds the stays (this is the same kind of issues that the Big Agnes chairs have as well). I am currently back to using my old Trekker chair (shown above in purple) which has always performed perfectly. The new Compack chair design is also different and does not have a full bottom pocket to hold the pad and it is now an ounce heavier making it only 3 oz. less than my old one. Thermarest has a newer version of the Trekker chair that is more durable and they have dropped it down to 9.5 ounces, this is what I would currently recommend. A light chair should not be so hard to achieve. This is the new pad and chair combo on solid sandstone! Yep it looks short but 36″ is ample room to get my shoulders and hips on, even at 6’1″. Now when it gets really cold or on snow I will continue to carry a full length Ridgerest and more for full body insulation. For most situations I have always used short pads and just put my pack and spare clothes under my legs and feet. On those trips where the nights will be in the 20’s I found that the SMD packs, which have no padding, leave my feet and heels too unprotected. I started carrying a 10″ X 12″ square of Ridgerest pad (<1 oz.) that I put inside the sleeping bag and it is fabulous, no more cold heels and it stays in the right place all night! I can use it as a sit pad on breaks too. 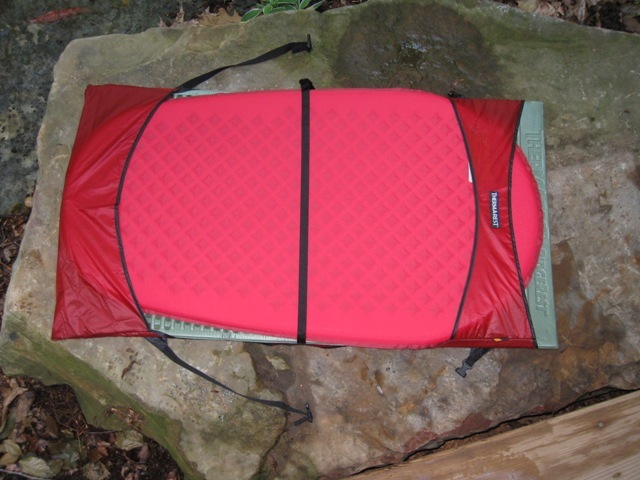 My newest pack, the Kalais, has a padded back panel that helps pad and insulate the feet. Obviously there are any number of combinations of closed cell pads and inflatable pads with different lengths, thickness and R-values; to make it easier to choose, here is a chart comparing pads for R-value, thickness and weight, sorted by weight. 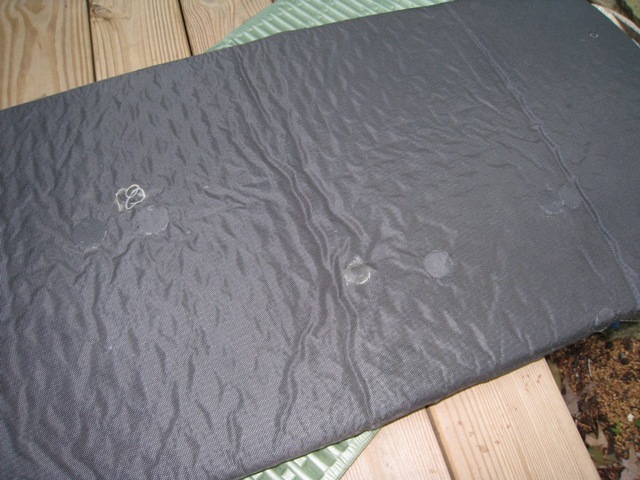 This is an exhaustive 2011 inflatable pad review from Backpackinglight including mini reviews of each pad (click on the pad model name in the final table). You will have to be a member to view this article. This entry was posted in Equipment and tagged sleeping pads. Bookmark the permalink. I’m glad I stumbled across this. This pad combination just might be exactly what I’ve been looking for. Just ordered the ProLite XS!! Thanks for sharing your ideas! As a fellow “40 years of walking/started in the 70’s/subscribe to the Colin Fletcher School of Comfort”, I really enjoy your blog. Reference your current sleep system, how are you carrying your dual pads? Can they both fit in the pad pocket of the Starlite/Swift packs, or do you need to carry one in the main pack compartment? Thanks for sharing your adventures and ideas! The 36″ Ridgerest and Prolite pads both fit in the Starlite pocket but in the Swift I just can fit the Ridgerest (folded in thirds) in the Swift pad pocket and I just roll the Prolite up into a something smaller than the size of a water bottle and put in the main compartment. Glad you found my site. Enjoying your blog. I’ve followed a similar “journey” through evolving backpacking gear over ~30-35 years, and mostly I’m glad to read that you are still backpacking…hope I, too, can keep it up awhile longer. Backpacking to beautiful locations is one of my motivations to try to stay in shape and keep the (personal) weight down. Agree with you on getting a restful night’s sleep and enjoying a couple of hot meals–worth the minor extra weight for those major benefits. Amazing selection of wonderful ultralight (and ultra$$$) gear out there, but I try not to get too carried away with the “gear head” stuff and remember that what’s really important to me is getting outside, hiking, and views. Glad you found my site. Yes, as we get older a few creature comforts really make a difference. Keep on walking!